The race for self-driving car technology heats up. Apple officially tossed its hat into the ring with a letter from Steve Kenner, Apple’s director of product integrity, to the US National Highway Safety Administration. Rumors of a secret autonomous vehicle lab surfaced earlier this year but Apple denied them. Apple can no longer hide its intent. Please consider Apple Reveals Plans for Self-Driving Car. Apple has for the first time publicly acknowledged its plans to develop self-driving cars, with a letter that urges the US highways regulator to promote “fair competition” between newcomers to the automotive industry and traditional manufacturers. In an unusually direct statement accompanying the letter, an Apple spokesman confirmed its work on autonomous systems that could be used to transform “the future of transportation”. Apple’s letter touts the “significant societal benefits of automated vehicles”, which it described as a life-saving technology, potentially preventing millions of car crashes and thousands of fatalities each year. The disclosure highlights how Apple may struggle to maintain its notorious secrecy in new product development as it enters more highly regulated markets, from transportation to healthcare. Hundreds of Apple staff have been working on an electric car for more than two years, people familiar with the project say. The Financial Times first reported the secret research lab, which is based outside its Cupertino headquarters in neighbouring Sunnyvale, in February last year. Since then, despite leaks about the project’s sometimes difficult progress, Apple executives have refused to admit that the automotive initiative exists. 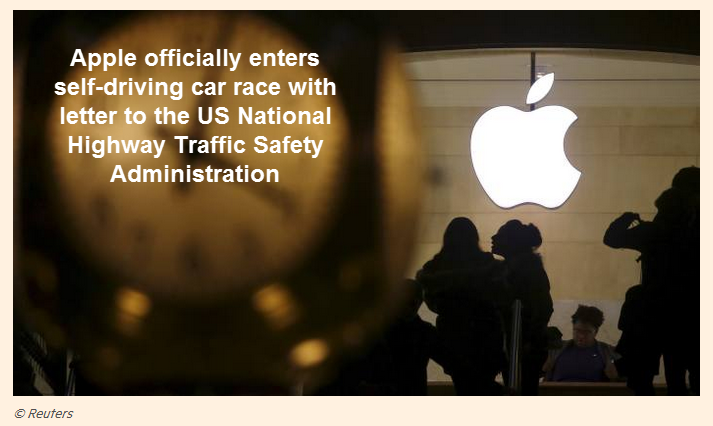 That position will be harder to maintain after the publication of a letter from Apple to the US National Highway Traffic Safety Administration, as part of the regulator’s regular dialogue with manufacturers about its rules for the fast-developing technology. The letter was signed by Steve Kenner, Apple’s director of product integrity, and was submitted on November 22. An Apple spokesman confirmed the letter, giving the clearest statement yet of the company’s intentions. In one of the five-page letter’s more controversial passages, Apple says that manufacturers should pool their data as they develop automated systems, to help everyone identify the multitude of unusual situations or “edge cases” that cars might encounter on the roads. “Because automated vehicles promise such a broad and deep human impact, companies should consider the ethical dimensions of them in comparably broad and deep terms,” Apple writes. These considerations include privacy, how the cars’ software systems make decisions and the impact on employment and public spaces, it says. Experts are divided on whether driverless cars could cause huge congestion or clear the roads, and on the extent to which they might free up space in cities that was previously used for parking lots and garages to build new housing or parks. Automation of jobs such as taxi and truck drivers might increase unemployment among low-skilled workers, some analysts have warned. As I have been saying for years, self-driving cars and trucks will eliminate millions of jobs no later than a 2022-2024 timeframe. My number one reason was competition. Add Apple to the list of competitors. That said, reading between the lines, Apple may be far behind. If Apple was ahead, it just might not be promoting data sharing. Regardless, Apple has significant resources and wants a piece of the pie. Competition is officially up. My statement that “millions of long haul truck driving jobs will vanish in the 2022-2024 time frame” is likely way off on the low side if one counts Uber, taxi, and chauffeur driven vehicles. That’s just Uber. And those jobs will vanish. All of them. What about Lyft? Taxis? For further discussion, including a rebuttal to the often stated claim that driverless vehicles cannot work in snow, please see Uber Offers Driverless Rides This Month! What About Snow, Rain, Pigeons, 80-Year-Olds on Roller Skates? My long-stated timeframe for millions of long-haul trucking jobs to vanish by the 2022-2024 is likely too distant. The components are all in place. Regulation has five years to catch up, and it will. Competition ensures success and DOT is already on board. Amusingly, some accused me of being “religious” when it comes to self-driving vehicles. This is not religion, this is science, and it will happen far sooner than deniers think, and quite possibly sooner than I think.